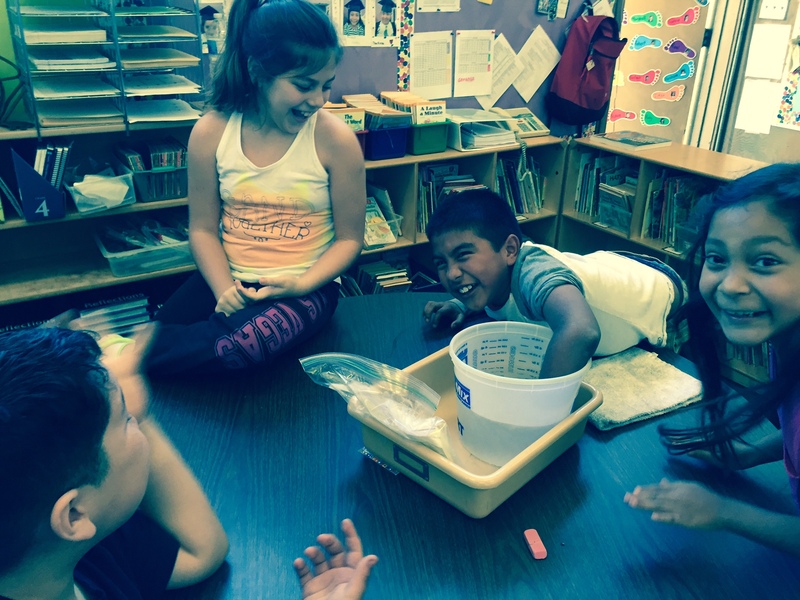 Introduction: The Grade 4 Life Science Unit focuses on ecosystems and addresses the California Science Standards for 4th grade Life Science. By the end of the unit students will know: ecosystems are communities of organisms that interact with each other and their physical environment; that living factors are called biotic factors and non- living factors are called abiotic factors; biomes have specific biotic and abiotic factors that make each one unique; all organisms have needs that are met by their environment and adaptations provide an advantage in meeting those needs; basic interactions in ecosystems are food chains and food webs in which matter cycles and energy flows; overtime, ecosystems maintain a balance, but that balance can be changed positively or negatively by natural and human actions. The Grade 4 Life Science Unit is presented to students through a series of investigations, experiments, active learning experiences, questions, and assessments. Assessments include: pre-, post- and 3 formative assessments. Conceptual Flow Narrative: The Grade 4 Conceptual Flow Narrative for Life Science: Ecosystems builds on the concepts presented on conceptual flow graphic by describing the concept(s) addressed in each lesson and the links that connect each lesson to the next. Lessons are linked to the previous lesson and the lesson that follows via a conceptual storyline to enable the development of student understanding as they progress from one concept to the next. After students have completed the Pre-Assessment, they begin their exploration of life science with Lesson 1, “School Walk Around.” In this lesson students learn that the world consists of biotic (living) and abiotic (non-living) components. Students learn that these components can be identified anywhere, including their school grounds. In the previous lesson students learned the differences between biotic and abiotic things. In Lesson 2, “Plot Study,” students learn that these components interact in an ecosystem. Students study a small plot of the school grounds to identify abiotic and biotic factors and different types of interactions. In Lesson 3, “Biomes,” students apply their understanding of the interaction of biotic and abiotic components of an environment to specific biomes. Students research various biomes (e.g., tundra, desert, grasslands) and compare and contrast biotic and abiotic factors. They summarize their learning in a fold-able book. Formative Assessment #1 is aligned to the concepts in Lessons 1-3. As a formative assessment, student answers provide feedback to the teacher and student for any adjustments in the learning. In Formative Assessment #1 students demonstrate their understanding that ecosystems are made of abiotic and biotic factors that interact with each other. Students are asked to identify abiotic and biotic components in a desert biome and to explain two types of specific interactions (e.g., snake interacting with rock for shelter, lizard eating insect for food, cactus using rain for water). Lesson 3 wraps up the concept that ecosystems are made of interactions between and among biotic and abiotic components. Lesson 4, “Basic Needs,” introduces the concepts that living things have needs that are met in their environment, and living things have adaptations that help them better meet their needs. In Lesson 4, students compare the needs of humans, pets, and wild animals to find the common needs of food, water, shelter and space. In the previous lesson, students learned that living things have needs that are met in their environment. In this lesson, students learn how a balance of food, water, shelter and space impact living things. In Lesson 5, “Oh Heron! Ecosystem Game,” students play a simulation game to learn how a balance of food, water, shelter and space impact living things. Students recognize the ebb and flow of resources and number of organisms within a given area and that if resources are limited, organisms can die. Having learned the importance of balance for survival in Lesson 5, students in “Lesson 6, Sniff This!” explore how adaptations provide an advantage to living things to meet their needs. In a simulation, students learn that an Island Fox’s olfactory receptors are adapted for a keen sense of smell that the fox uses for communication and obtaining food. In Lesson 7, “Blubber Gloves: It’s All About Insulation” students continue to explore adaptations as an advantage for a particular environment. In this lesson, students wear “blubber gloves” to recognize how blubber enables animals to function in polar marine ecosystems. Having experienced examples of animal adaptations in Lesson 6 and Lesson 7, Lesson 8, “Seed Adaptations for Dispersal,” provides opportunities to investigate how seeds are adapted for dispersal. Students observe a variety of seeds, identifying adaptations for dispersal that include flight, floating and carried by animals. Students design seeds with adaptations to meet one of these modes of transportation. A field trip to Lotusland is the impetus for Lesson 9, “Lotusland.” In this lesson, students apply the concepts of adaptation and ecological interdependence in a diverse botanical garden. While this lesson is not optional, if a field trip cannot be scheduled, students should have developed an understanding of these concepts in Lessons 4-8. Formative Assessment #2 is given after Lesson 9 as a indicator of student understanding from Lessons 4-9 that living things have needs met by their environment and that adaptations provide an advantage in meeting those needs. As a formative assessment, student answers provide feedback to the teacher and student for any adjustments in the learning. In this assessment, students demonstrate their knowledge in a simulation about camouflage in which they gather, chart, graph and interpret the data that supports the adaptation concepts. Lesson 10, “Food Chain, introduces the third subconcept that matter cycles and energy flows in ecosystems. In Lesson 10, students learn about the interaction of living things in a food chain as an example of how matter cycles. Students create food chains for at least 2 different biomes so that they can recognize that all food chains use the sun’s energy for producers to make nutrients. Producers are eaten by consumers (herbivores), which are eaten by other consumers (carnivores or omnivores). Decomposers break down producers and consumers, returning nutrients (matter) into the soil for the producers to use again. In the previous lesson, the emphasis was on producer and consumers. In Lesson 11, “Crawly Composters,” students learn how decomposers break down matter and return it to the soil. Students build worm composters and observe how the worms help decay the garbage, converting it to rich nutrients for the soil. In Lesson 12, “Mighty Microorganisms,” microorganisms are introduced as another kind of decomposer. Students investigate the impact of mold on bread, and view slides of other microorganisms that recycle matter. Students understand that microorganisms can be both beneficial (as in decomposers) and harmful as in those that cause disease. In previous Lessons 10-12, students learned that food chains, with all of the parts (producer, consumer, decomposer), recycle matter. In Lesson 13, “Matter Cycles— Sum It Up,” students perform a readers’ theatre to summarize their key learning from the previous lessons. In Lesson 14, “Energy Flow,” students conduct a simulation that represents the flow of energy through a food chain from the producer to the top consumers. This lesson serves as an introduction to this concept that students will learn more deeply in middle school. Students build on their knowledge about food chains and apply it to food webs in Lesson 15, “Food Webs.” In this lesson, students build a food web from yarn to learn that a food web is the interaction of food chains within a specific community. Students also learn that food webs provide various pathways for matter to cycle and energy to flow, and that a change (e.g., removal of one producer or consumer) to one part of a web, impacts all of the food chains in the web. Formative Assessment #3 is given after Lesson 15 as a indicator of student understanding from Lessons 10-15 that matter cycles and energy flows in food webs/food chains through producers, consumers and decomposers. Students are given information about a food web in the Channel Islands. They are asked to create the food chains that make up the food web, and identify and label the roles of each organism (producer, consumer, decomposer, herbivore, carnivore and omnivore). They must also indicate the flow of energy with arrows. As a formative assessment, student answers provide feedback to the teacher and student for any adjustments in the learning. The unit concludes with two lessons that introduce the concept of ecological balance. In Lesson 5, “Oh Heron,” students participated in a simulation game in which the number of living organisms was dependent on the amount of resources available. In Lesson 16, It’s An Otter Story,” students investigate the impact of human action on ecological balance recognizing that it can have a positive or negative impact. In Lesson 17, “Island Fox Outreach,” personnel from the Channel Islands come to the classroom to solidify student understanding about human impact using examples from the Channel Islands. THIS IS AMAZING! Thank you so much for sharing these lessons and learning activities. Wow! This is so fantastic! You can tell these lessons were really thought out well; they are SO clear and useful! These are going to be a great help in my classroom! Thank you! Thank you! I cannot wait to try some of these activities. I was so excited to find this wonderful unit. The Science Books in our school are over 25 years old. I have rewritten and developed almost all of the units, but lacked a good ecosystems unit. I always say we don’t need to reinvent the wheel, but we do need to go from tube tires to steel belted radials! THANK YOU for the free use of your work. You saved me a lot of hours! Thank You so much this helped me on my 4th grade homework you saved me!!! Thank you many times!!! This is marvelous!! Thank you so much for this resource! !